315 people in our community are currently praying with you. 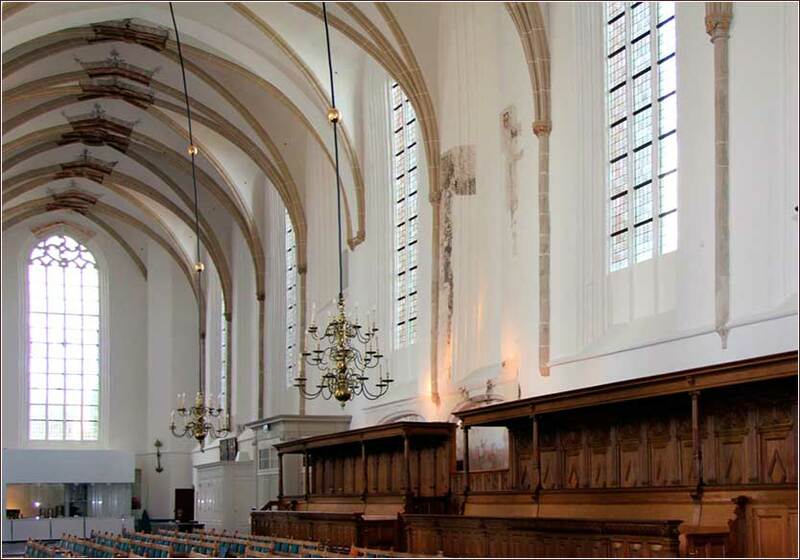 A nice update on a beautiful old hymn. Holy God, no one can put together what has crumbled into dust, but you can restore a conscience turned to ashes. You can restore to its former beauty a soul lost and without hope. With you, there is nothing that cannot be redeemed. You are love; You are Creator and Redeemer. I praise you with my every ounce. I fear the lesson, my God, of the fall of Lucifer, full of pride. I pray you will keep me from such a terrible fate; keep me safe with the power of your Grace; save me from falling away from you. Save me from doubt. Incline my heart to hear your mysterious voice every moment of my life and thus be led to call upon you, for you are present in every thing and every moment. 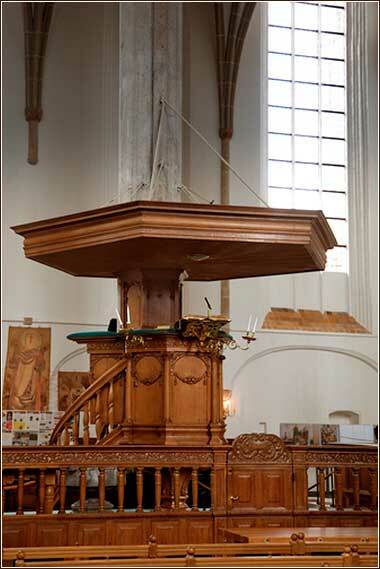 Pulpit of Sint Joris Church, Amersfoort, pictured at top of the page. The basic meaning of this simple and charming line of prayer is sufficient, without much need for exposition. Like the phrase before it, it is a petition in form but not in meaning. Really, what are the chances we are going to starve today? It may sound like a petition that the person praying be fed for a day, but this is the least of its meanings. Christ nevertheless has us pray it in the form of a petition, in order that we might learn how to pray. First, the scope of our petition: We do not pray to become rich; but we do not hesitate to pray for the necessities or basic comforts of life. Second, the petition is plural: “give us bread today”. It is, in part, an intercessory prayer. We do not pray, “feed me”, and good luck to the rest of you guys. Nor does “us” include only the speakers when a group is praying. It is, in effect, a prayer for mankind. Third, we pray for food only for one day. We will see much more on this at the end of Chapter 6, where Christ delivers a long, beautiful, and important message about living in the present. In fact — and most people are quite taken aback to learn this — the end of Chapter 6 is the primary reason we use the expression “daily bread”. The word used by Matthew (and Luke) and translated as “daily” was a Greek word epiousios, the meaning of which is total mystery. The Lord's Prayer is the only known occurrence of the word. Nobody actually knows what Jesus said! cholars have searched high and low, and cannot find the word used anywhere else in ancient Greek. The correct translation is, therefore, “Give us this day our _________ bread” — which means almost exactly the same thing, if you think about it. But it is not as pleasing to the ear, so the King James coalition added “daily”, which conforms to the lesson at the end of the chapter. Finally, one can certainly add a lot of meaning by meditating on the many symbolic uses of bread in the Bible. Christ said, “I am the bread of life”. (John 6:35) At the last supper, Christ broke the bread and said, “This is my body”. (Luke 22:19) We can thus pray this phrase for salvation, for Spirit, for our share of Christ's sacrifice, and more. My spirit pants for thee, O Living Word. Teach me to love Thy truth, for Thou art love. Matthew 5:40 (NASB): If anyone wants to sue you and take your shirt, let him have your coat also.